I think we all noticed that hair clips are coming back to fashion. The must-have spring/summer 2019. It will probably make you regret all your little girl hair clips you throw away… Or not. Mine weren’t as chic and sophisticated lol. This new trend of hair accessory has even made appearance in the latest fashion weeks. There are different kinds of hair clips and we can find some at Gucci, Dior, Versace and many others. Fortunately there is no need to turn ourselves towards luxury brands to get very nice ones. Which type of hair clip for you? From the largest to the finest, we can find hair clips with pearls, rhinestones, sequins and stones. Some do not play in delicacy with large & wide models featuring a Word, or logo (Gucci for example). It remains the most discreet with a single bead, a flower, a diamond or other. The hair clips are worn with all types of hair but you have to choose a suitable model. If you have fine hair, avoid XXL or too imposing hair clips that could slip. Nothing is more irritating than having to redo our hairstyle every 10 minutes because our clips keep falling. Of course it also depends on the type of hairstyle. 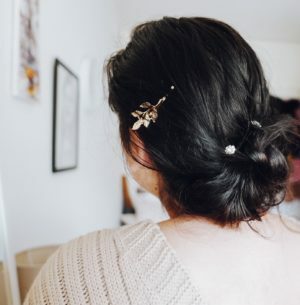 How to wear Hair Clips? The big models are perfect for styling a bun or half ponytail. The finer strips can be worn on any type of hair attached or loose. You can just wear one or accumulate them. A gair clip on the side of the head is the perfect method to clear the strands of your face. Also behind the head, it’s very handy to keep your hairstyle in place or just to give a style. I find lots of inspiration and tutorials hairstyles on Pinterest. 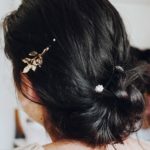 Where to find hair clips? As a result of my Instagram stories, you were more likely to ask me the same question than to tell me about brands and boutiques. So as promised, I did some research on shops and brands I already knew. I didn’t find any hair clips in city center like at Zara, H&M, Mango, IAM, etc. But I found some online at ASOS, ISawItFirst, PrettyWire and Amazon. I love those from PrettyWire but most are out of stock… I may be buying from Amazon, but obviously I don’t have great expectations on the quality and lifespan of their hair clips. So what do you think? I personnaly love this! Especially now that I have short hair and that I am limited regarding hairstyles. A small accessory and it changes everything, even during our bad hair days. *I don’t know where my hair clips are from… probably IAM. OhMadame uses affiliate links. This post is not sponsored.